The creative process is complete, the kiln is cooling. 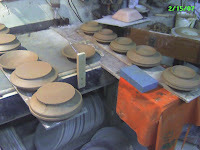 There is a quiet scene around the kiln as I wait to see how it all ended up. 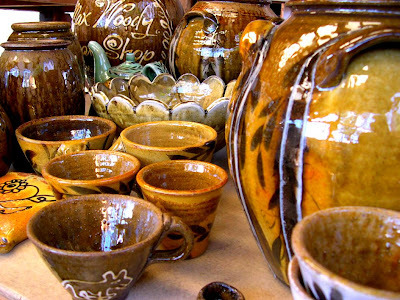 There is only so much a potter can do. 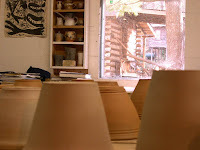 I always have a sort of helpless feeling at this point, and no matter how the pots come out I will have what Shawn Ireland calls "the kiln blues". 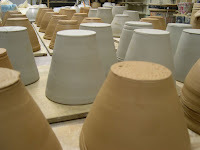 I think it is due to the fact that there is nothing i can do aside from grinding the bottoms that will improve or change the pots. The other reaction I have(always) is to look at what went wrong before I give the good pots a chance. It's my way of picking up where I left off in the creative cycle. With the disappointing pots, I can reenter the scene and interpret what may have happened and try to prevent it from happening again. In the case of an exceptional pot it's my way of saying to the pot, "What happened?" or "How can I make that happen again?". The potter's challenge is to repeat good results and resolve bad ones. I had a great visit with Tom Turner today. 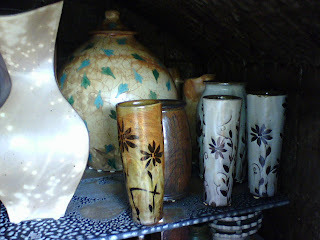 He showed me some of his favorite pots in his collection. 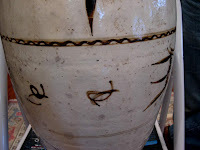 Here are a few detail pictures of a large Cizhou (Tzu'chou) jar we photographed. 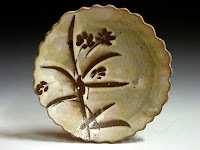 You can see Tom's beautiful porcelain work at his website. Click here. 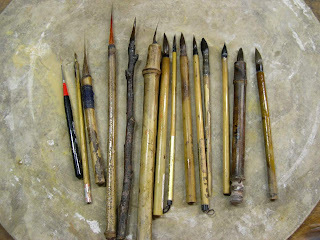 Here are the brushes I have been using. Some are handmade, some made in China(probably by hand). I generally use 2-3 brushes for all the work. Some folks may think that good painting is all in the brush, and there is truth to that. I obviously have my favorite brushes but once I get real, real going, say, day two of my decorating week, I can usually get a lot of different shapes and line quality out of the same brush. For me, it's a combination of knowing where the brush lands on the pot, the wrist motion of a certain brush mark, and the speed at which the mark is delivered. The material being painted also makes a big difference. Since my kiln is a 15 minute drive from the shop, I bisque fire everything to cone 08. 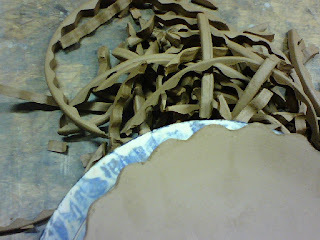 Leather hard clay is great to paint on, but I paint everything on bisque. I also "partition" my tasks. 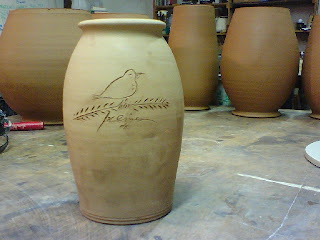 I will make pots for 3 weeks, then spend a week decorating and glazing. 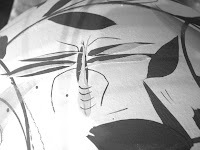 I like the momentum I get from focusing in on throwing form and then exploiting surface with pattern. I try really hard to see the form and line of a pot and I think the patterns I use are even more successful on a good form. 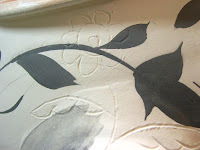 I tend to paint patterns on most pots, but sometimes a pot has such a nice line that I leave it alone. I once heard the phrase, "decorate the dogs", and if that were the case for me I guess I make a lot of dogs. 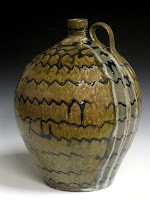 My intent is for the pattern to enhance the pot and give it an added layer of complexity or subtlety. 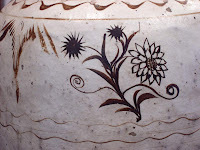 This week I have been decorating my pots with three techniques. 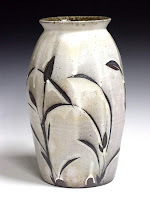 The first format is painting black and white slips on the bisque ware. 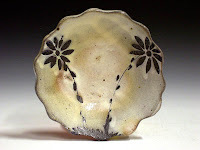 Another is painting my special wax resist on the pots and pouring or dipping into a white slip. The third is slip trailing with colored slips. 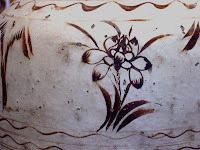 Here are some closeups of slip brushwork on a large jar.The first shows some an incised flower on the pot's shoulder with vine painted in black slip. This, hopefully will create a subtle depth to the surface of the jar. A clear glaze with a little bit of iron is then poured over the pot. 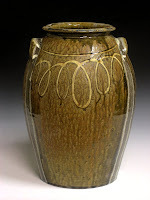 This glaze has a nice honey-amber color when fired in the wood kiln. 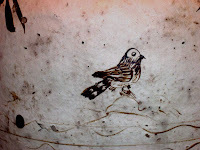 The second is an example of really tiny painting of a mosquito with my special brush, courtesy of Jenny Mendes. Now that summer is long gone, I guess I was feeling a little nostalgic. Today, I finished the first pachyderm teapots that I have made in over two years. In stark contrast to the traditional forms that i have been making, working on these teapots required a different bag of pottery tricks. They're very clever pots, but I seemed to remember most of the moves. It was fun. It was a beautiful and warm day today. A good day to set the pots out to dry. It was also one of those days when I look for work to do outside. 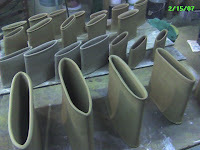 But with a firing scheduled for Sunday, I was busy finishing up the last pots before the glazing begins. This weekend over 140 studios and galleries will open their doors for the annual Fall studio tour of Mitchell and Yancey Counties. 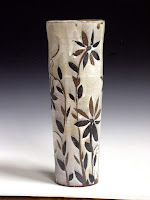 I have lots of envelope vases, 1/2, 1, 2, 3 gal jars with botanical brushwork, some nice gifts. Help yourself to hot cider, tangerines, and all sorts of snacks. Come on by, we hope to see you in Micaville. Click here for more Tour info. Click here for a map to my studio. It should be a lot of fun and the weather is going to be good. In the Research & Development Dept. 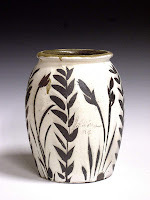 we have this quietly fantastic piece of pottery made by Daniel Seagle, a 19th century pottery from Lincoln County, NC. 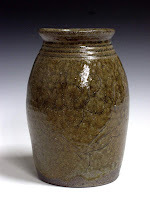 I first saw this fine and subtle pot at the NC Museum of Art in Raleigh 2 years ago. 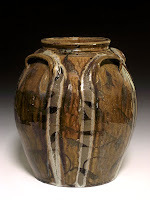 It's also in the companion catalog of the show, "The Potter's Eye" by Mark Hewitt & Nancy Sweezy. That's where I have been looking at it lately: in the corner of my studio where I gradually stack up books during the course of my cycle of work. This pot slays me. 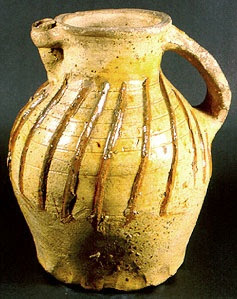 No doubt this shape/format was repeated by Seagle and many other potters for storage of food, serving of food, etc. This pot has survived the countless times it was used, as evidenced by the many little chips along its rim. From my experience this type of edge on a pot is vulnerable to chipping, yet this pot had enough clay to spare and has nicely "rounded off" over the years. Yet the squareness of the rim is intact and leads the eye to the overall shape that at first glance (and second, and third glance) looks square. But the measurement shows that it is 9" tall by about 8" at its widest. Not quite square, but by banding just below the rim Seagle has tweaked the proportions a bit. 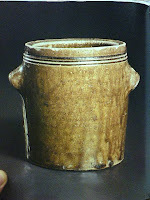 The handles or "ears", placed just below the ridges around the rim give this pot its sublimely anthropomorphic look. It may be without literal mouth, nose, or eyes, but this "head" listens, standing stoic, waiting. This stroke of brilliance happened not by the use of calipers, or labored thought, templates, etc. 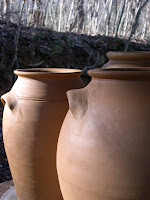 but probably exist here as a result of all the jars that Seagle made up until this pot. 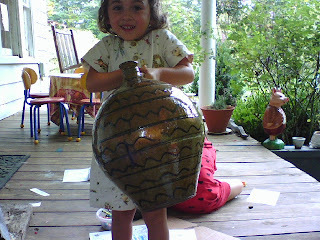 I don't mean to say that this pot was a fluke, but it was made with many others like it. It was made in the course of a day's work. 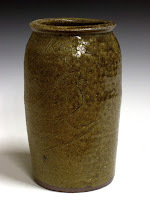 In our information age we can share with the world great things like this jar, I am influenced by these great pots. I'd love to hold this pot and "look it over". I'll add it to my list of pots to "look over". I promised Chris Luther that I'd upload this as evidence that we in fact made pots in Norfolk and tossed'em in the harbor. This jug lasted about a half an hour. As we observed, the jug was plugged at the mouth, but the bottom gave way first. It opened up and took on a little water. Then to our surprise it righted itself and floated for a little while longer. I've heard of salt glaze, but salt slake? Enjoy. A view of the stack in the Barns kiln. Nov. 17, 2007. Matt Kelleher's pots are at the left. It's been a while since I've had time to write. 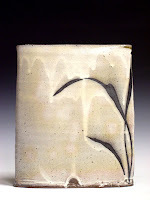 Recently, I teamed up with Matt Kelleher and fired the salt/soda kiln at the Penland School of Crafts. 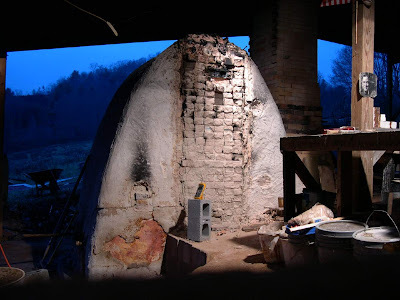 This kiln was built at the Barns by Tracy Dotson and Suze Lindsay in 1993(?). 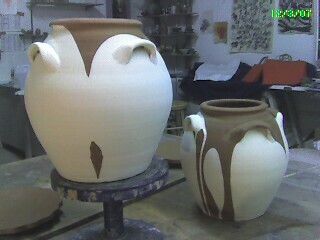 During my residency(1998-2001) I repaired the kiln every other firing. 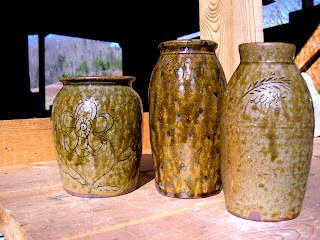 Something was either melting, sagging, or cracking, but the kiln produced some nice pots. This kiln is a true survivor. At 14+ years old it's had quite a history. 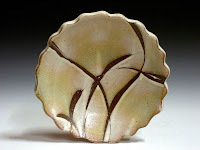 Suze fired the kiln during her residency, then Terry Gess fired the kiln until 1998, and I came along and fired it until 2001. 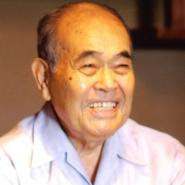 The kiln somehow escaped demolition and in 2005 Matt and his wife Shoko Teruyama became residents and Matt revived the kiln. I must say it is firing very nicely (thanks to Matt's kiln compassion!). Old salt kilns never die, they just slowly melt away. 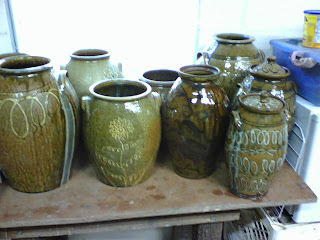 Here are some of the pots we got out the kiln last week. I will be joining Mark Shapiro and Sam Taylor in D.C. for our "Roadtrip Reunion" homesale, Nov.3rd & 4th. Check it out. More about this later. “When I begin a session in my studio, the process of remembering and dreaming begins. 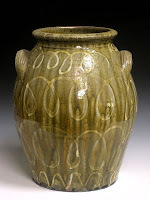 My pots are formed with a steady approach to the ideal and the unexpected—they are part memory, part hope. My good ideas and clever intentions are no match for the exceptional pot that just seems to happen. 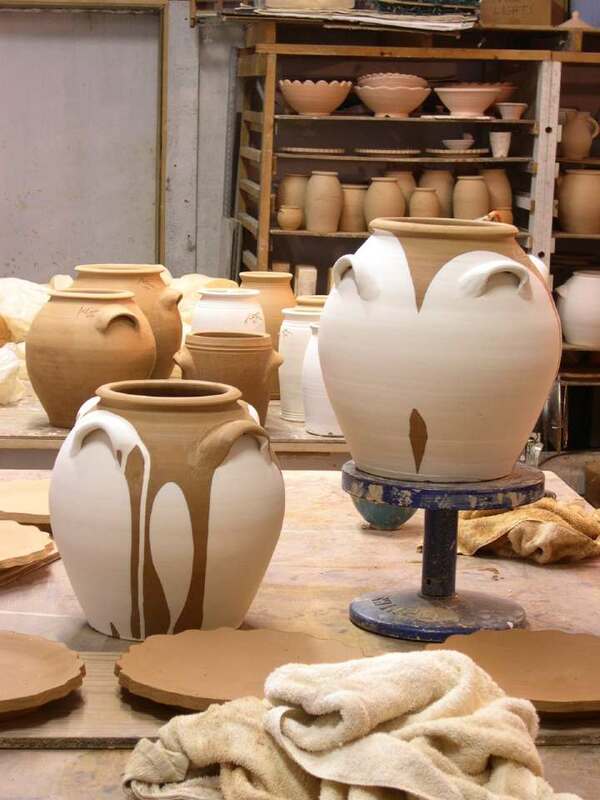 Each pot emerges from a combination of intense focus, forgetting, letting go, and just doing. 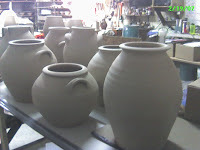 These pots are from the most recent firings, nos. XXIII & XXIV. 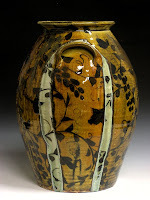 They will be featured in the upcoming show "Locally Thrown: Studio Pottery Invitational" at the Ferrin Gallery at their new location in Pittsfield, Massachussetts. I will post a link to the online show when it goes live. 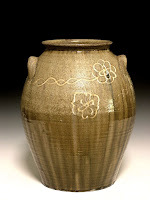 2 handled jar with slip trailed swag, alkaline ash glaze, woodfired with glass placed on handles,15" x 11"
4 handled jar with underglaze pattern, alkaline ash glaze, woodfired with glass placed on handles,12.75" x 11.25"
2 handled jar with slip trailed flowers, alkaline ash glaze, woodfired, 13" x 10.5"
2 gallon jug, slip trailed sine waves, alkaline ash glaze, woodfired with glass placed on handle, 12.5" x 9.5"
2 handled jar, slip trailed loop d loops, swags, alkaline ash glaze, woodfired, 13.25" x 11"
2 handled jar, underglaze vine pattern, iron glaze, woodfired with glass on handles, 16" x 11.5"
Here are the pots that have been decorated, glazed, but not yet fired. Some of you may be scratching your head about the pot in the very back that looks likes it's already been fired. It has, but it is being refired. Hope springs eternal. 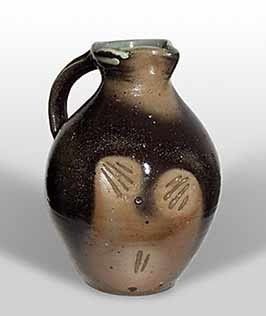 The gray glaze in the lower photo is a "clear" glaze that shows underglazed brushwork. 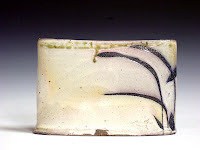 It was a little underfired, but showed promise in other areas of the kiln. 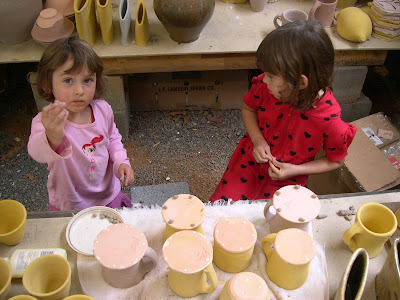 Here are Lillian (age 3.5) and Evelyn (age 5.5) helping out during the loading of XXIV. Here are a few of the forms I've been working on this past week. There's not a lot of room to move with all these pots around. It must be time to light up the kiln. Look for smoke on March 3rd. 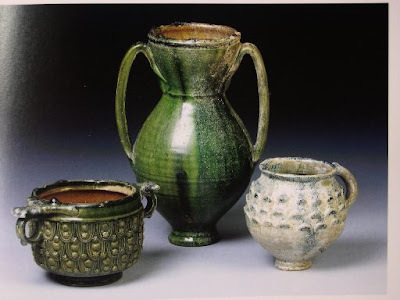 Three roman vessels, all w/ vitreous glaze. Double handled cup w/ applied scales, AD 20-70, said to be from Arles, Southern France; double handled vase, c. AD 70-100, said to be from Tharros; single handled decorated w/imbricated leaves, Asia Minor, 1st c. AD.height tallest 17.5cm (7in). Sometimes archeologists really don't know how this stuff is really made. check this story out.